One of my Christmas presents this past year was a surprise trip to Chicago to celebrate New Year's and my 25th Birthday! Unbeknownst to me, a very sneaky Ruben arranged the whole plan - from the accommodations to getting me to take time off work. 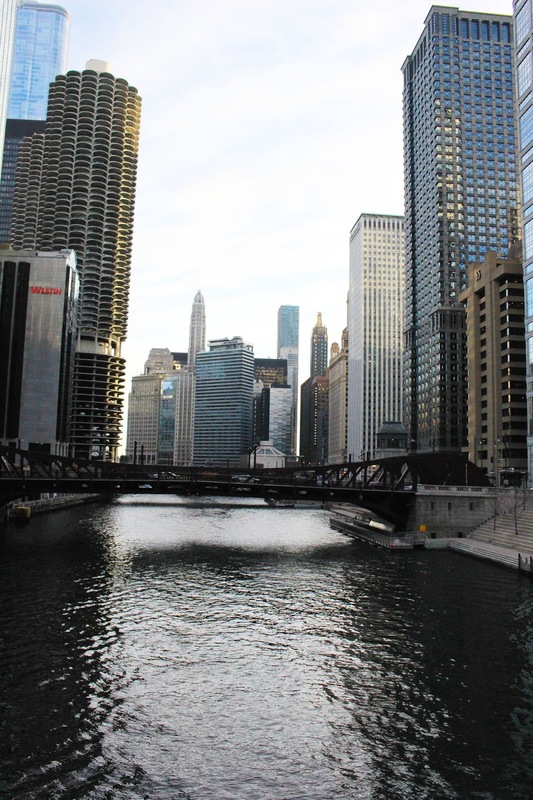 A few days later, we set out on the road travelling to a city we've both always wanted to visit - the Windy City: Chicago! We had 5 days of exploring, adventure and lots of delicious food! 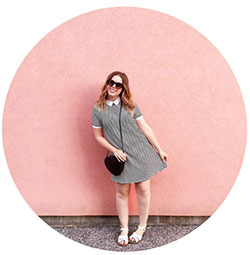 I put together a small city guide to highlight some of my favourite spots that we visited. 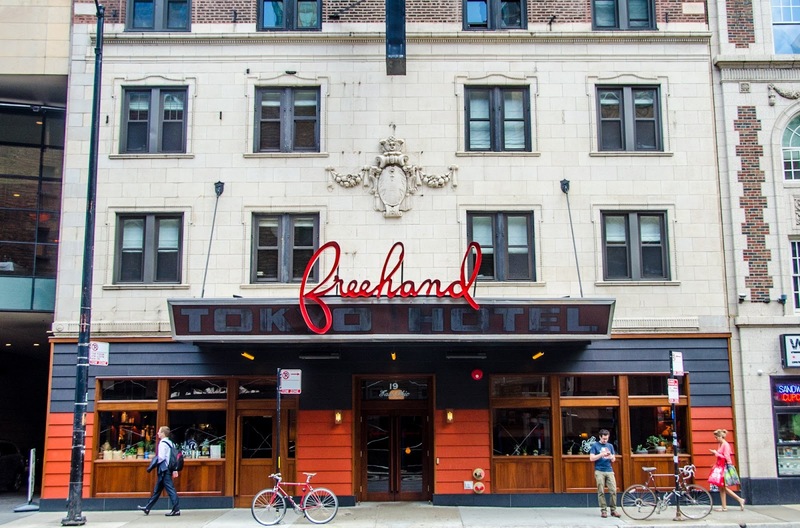 We stayed in River North at the Freehand Chicago - an eclectic hotel/hostel. I consider it a good mix between hostel and hotel because you have people of all demographics and ages staying there and they offer both dorm rooms and private rooms. The shared kitchen in the basement allows you to cook and store your food, which gives off a more hostel vibe, while the awesome cafe and bar on the main floor give off that chic boutique hotel vibe. -Broken Shaker. The bar on the main floor of the hotel. A super chill spot to hangout, enjoy a few drinks and good company. Lots of unique concoctions and delicious cocktails! -Super convenient location. We were in such a central area, it made walking around very easy and there was a Shake Shack on the corner, soooo that's all you need to know. -Lack of natural light. It's kind of hard to explain, but our room was facing the inside of the building, and though we had a window - it looked out into a courtyard and other adjacent rooms surrounded us. -No bathtub. Again, I'm not usually one to complain about hotel rooms and the accommodations, but after a long day of walking all I wanted to do was take a bath and unwind! 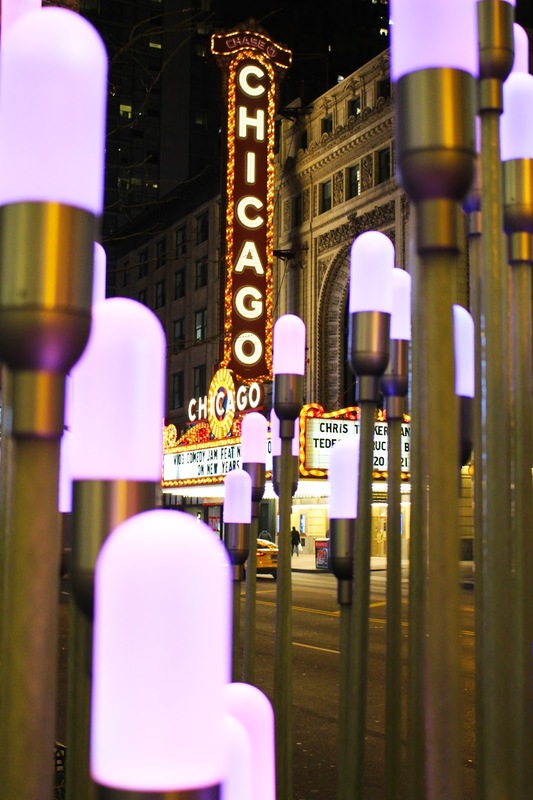 Staying in River North was a great spot because we were so central to everything and right in the downtown core; not far from The Loop and the Magnificent Mile. We arrived late afternoon as the sun was setting, so our first night out was an adventure and nice to see the city at night. It was so beautiful to walk around and see all the buildings lit up and illuminating the river. We were surrounded by tall buildings and intriguing architecture easily one of our favourite things about the city. I found that all the different neighbourhoods were pretty spread out (or maybe it seemed that way because it was Winter and almost unbearable to walk for long periods of time) hence why we relied heavily on uber. When we weren't even looking for it, we stumbled upon the Chicago theatre and it's sparkly marquee! We took a few minutes to admire it's beauty and wonder about all the things that have gone on inside that historical venue. A super fun adult arcade/bar where we spent a few hours sipping a plethora of beers and playing free arcade games. Another thing about Chicago I loved was how nice everyone was! Our waiter at Beercade was so awesome and kept surprising us with different beers to try and giving us suggestions on things to see and do in the city. He also put the Leaf game on the TV when I asked, so that made him even more amazing ha ha! The city is scattered with tons of incredible murals, but we only got to see a handful. I definitely want to visit again once the weather is warmer and really go mural hunting to find all the good ones! A couple with a really cute dog offered to take this photo for us - again, nicest people ever in that city. If I'm being totally honest, the food was probably my favourite part about Chicago! We didn't even dive nearly as deep as I wanted to in the culinary adventures, but the places we did visit were must go-to's on my list. Of course we tried deep dish pizza, and while I don't know where the best is in the city (sorry, I didn't finish my research) the one we had at Lou Malnati's was preeeeetty good. Sadly, I have no photos to share from that experience - we were too busy stuffing our faces! We did make the mistake of trying our first deep dish at Pizzeria Uno, which was not the best and sadly disappointing. It was right next to our hotel and figured it had to be good as it was always busy, but we soon learned it was just another tourist trap! Longman & Eagle - OMG! This place was the bomb.com - probably one of the best places I've ever had brunch. We visited twice during our trip because it was that good! The first time around I enjoyed the Fried Chicken and Waffles with Sweet Potato and Pork Belly Hash, while Ruben had the Cinnamon French Toast with cider compressed apples, smoked vanilla panna cotta and apple jam. One word - delicious. The second time around I opted for the Cinnamon French toast while Ruben fancied the PBR breakfast - yep, a can of beer with your bacon, eggs and potatoes! Does it get much better than that? Sprinkles Cupcakes - they have been one of my favourite spots to visit for cupcakes ever since first trying them in California a few years back. 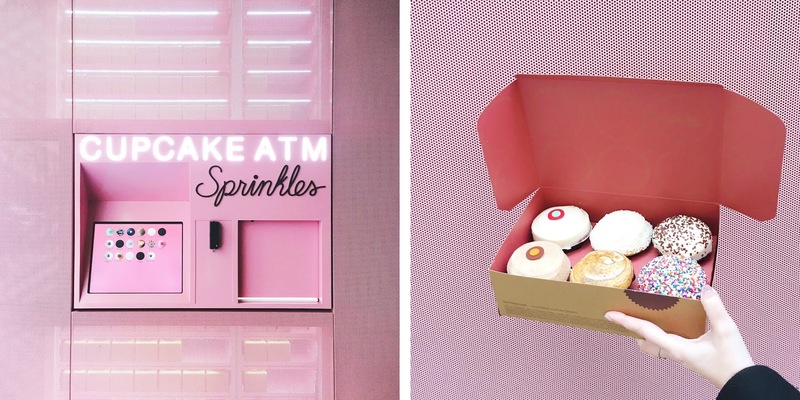 So when I found out there was a Sprinkles ATM not far from our hotel, I was really excited! Being that we were celebrating my birthday, I figured it was only suitable to grab a half dozen cupcakes to share and nibble on. Make sure you check their menu online first to see which days have the most inciting options as they alter the cupcake selection daily. Homeslice Chicago - I had seen this place all over Instagram and online so I knew I had to add it to the list. Another cool spot to check out with lots of photo opportunities. In the back, they have a camper van but it was too cold to go out and see. We each tried a slice of pizza and shared goat cheese bread sticks, which were both tasty. 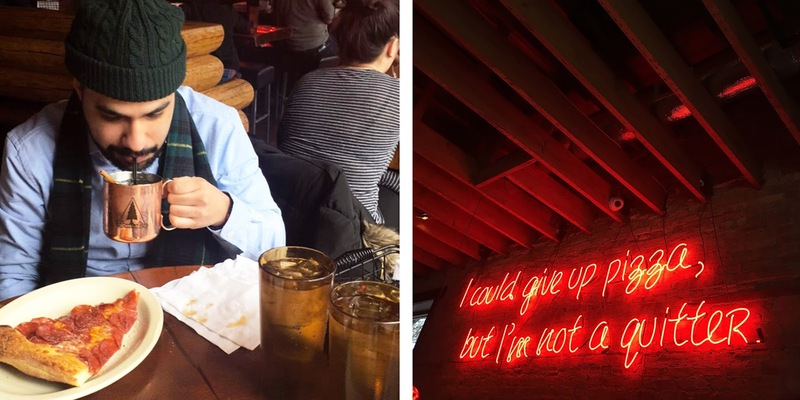 I stuck to trying local beers like Goose Island Green Line, and Ruben opted to try different cocktails like their special Moscow Mule. 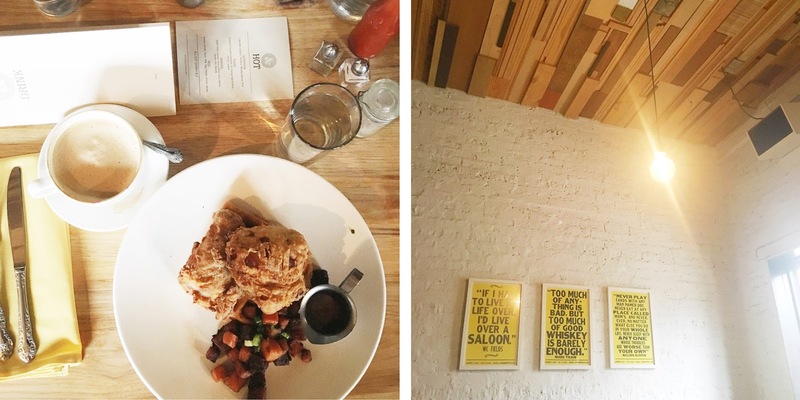 From the neon signs to the copper penny bathroom floors, this is another must see spot! 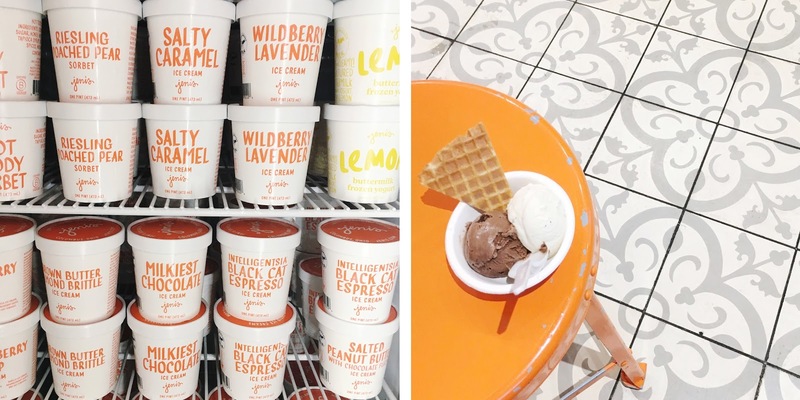 Jeni's Splendid Ice Cream - We visited two different locations and both were equally as cute as they were yummy! I totally wish I could've snuck a pint or two home, I've been craving it ever since leaving. The flavours are all so unique and different from your basic ice cream parlour, making it even harder to choose. Luckily they offer unlimited samplings so you can try as many as you please before you decide. I didn't get as quite adventurous being that it was my first time, I stuck with the safe players - milkiest chocolate and Ndali estate vanilla bean. They top it off with a waffle wedge and voila! Enjoy your heavenly treat. 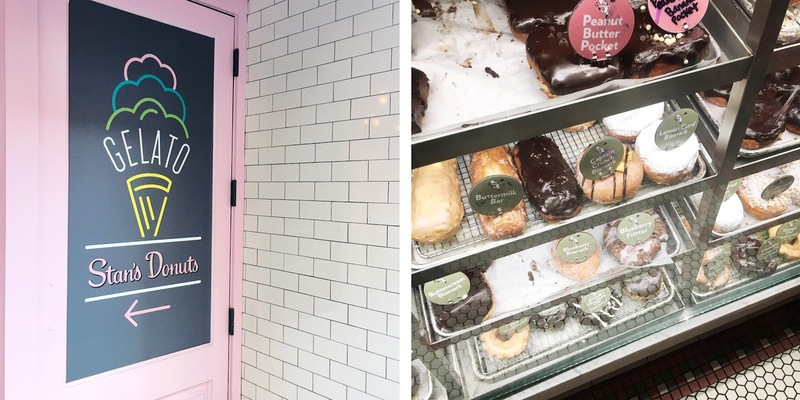 Stan's Donuts - from the pink tiled floors to the kitchenaid mixer lined wall, this place is nothing short of perfection! The donuts were so fresh and tasted like cake, all around delicious with so many to choose from. I would've loved to try one of their gelato shakes but it was below 0 degrees out and also 9:00 am! I definitely need to make another trip to Stan's upon my return. 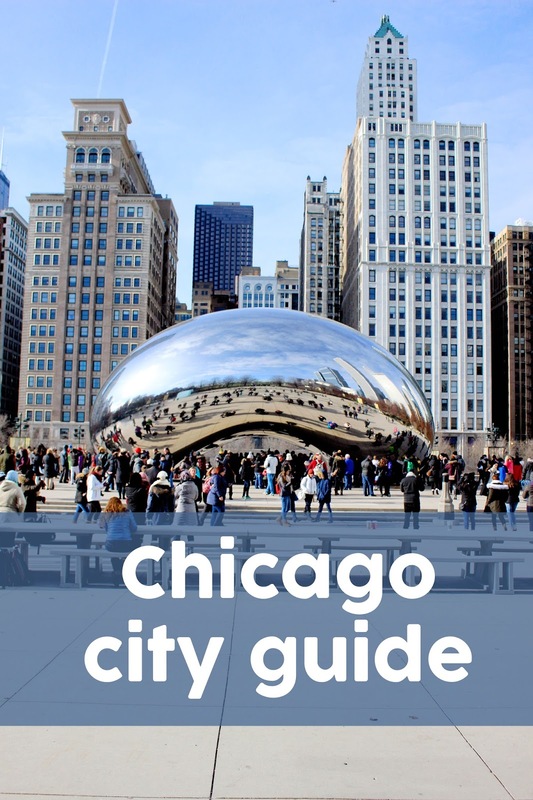 I really enjoyed putting together this guide and I hope you get to visit some or all of these places on my list - you won't regret it! 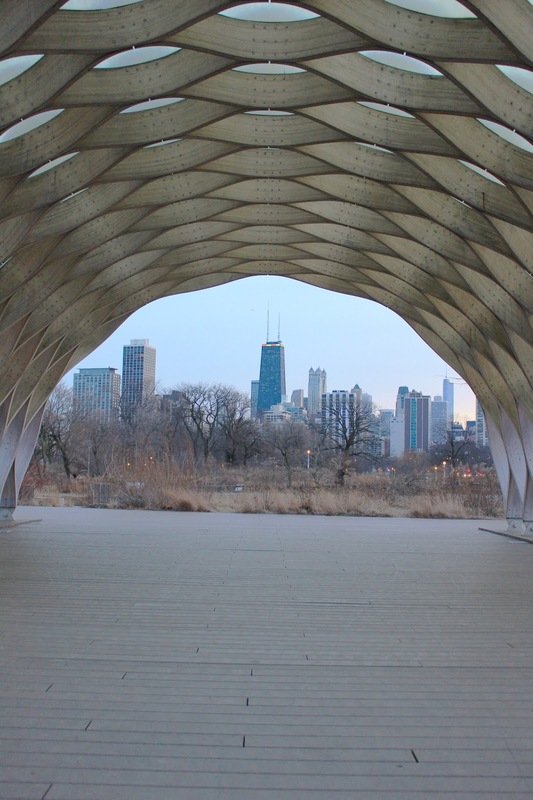 I'd love to hear about and see your favourite spots in Chicago, send me a message or leave me a comment to let me know! Hope this place turns out good. It’s great that this venue offers services such as catering, lighting, tables and chairs, table linen and parking. I am here to choose venues in NYC for my event, glad to know that they do not put any restrictions regarding music played.